Perhaps the best all-around, year-round, high-performance sports car ever built. Only yesterday did several leaked photos of the 2013 Porsche 911 Carrera 4 lineup find their way online. As predicted, today Porsche has released the fully skinny on the latest all-wheel-drive version of its iconic 911. The 991-generation had its debut last year at the Frankfurt Auto Show and since then both the coupe and cabriolet have been praised time and again for their updated styling, power and overall agility. In other words, the 991 is perhaps the greatest 911 to date. Now it&apos;s time for the all-wheel-drive to debut and Porsche has rolled out both the Carrera 4 and Carrera 4S Coupe and Cabriolet just ahead of their live debut next month at Paris. In order to transform the standard Carrera into all-wheel-drive, the German automaker has added the latest version of PTM (Porsche Traction Management). Like before, this all-wheel-drive system has a rear-focused layout and guarantees maximum vehicle dynamics on a variety of road surfaces and in all weather conditions. Compared to the outgoing 997 C4S, the updated PTM system is 143 pounds lighter. It also adds 1.7 inches in width to the back of the car and the rear tires are stretched out by about a third of an inch as well. 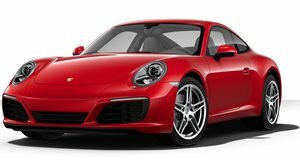 Engine options are directly carried over from the rear-wheel-drive 911, with the standard 3.4-liter flat-six producing 350 horsepower and the optional 3.8-liter flat-six in the 4S with 400hp. Porsche claims the latter engine in the 4S can go from 0 to 60 mph in 4.1 seconds and has a top speed of 185 mph. Both engines come with a standard 7-speed manual transmission and the optional PDK gearbox. All told, the 4S returns nearly 26 mpg combined when fitted with the PDK. 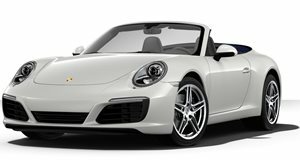 Other technology features include Porsche&apos;s new Adaptive Cruise Control to the entire model range, which controls distance to traffic ahead and vehicle speed. There&apos;s also an optional sliding glass sunroof and for cars with the manual gearbox, the Sport Chrono pack features automatic double-declutching during downshifts in Sport Plus mode. But perhaps the most noticeable and famous trademark of the all-wheel-drive 911 is the strip of lighting connecting the rear taillamps. This has also taken a new form with what looks like all LED lights. Set for a live debut at the Paris Motor Show late next month, the 2013 911 Carrera 4/4S Coupe and Cabriolet will hit US showrooms next February. A base 911 Carrera 4 Coupe will start off at $91,030 and the Carrera 4 Cabrio for $102,930. If that&apos;s not expensive enough, the 4S Coupe and 4S Cabrio start off at $105,630 and $117,530, respectively. Steep prices indeed but now you can drive the latest 911 year round - even in rough weather conditions. That certainly counts for something.